Excellent two bedroom apartment in the heart of Palermo Hollywood. 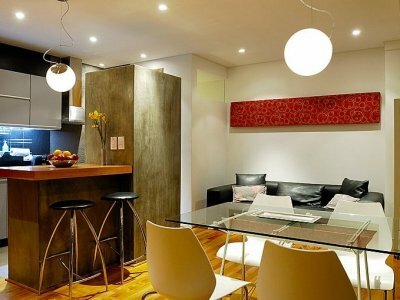 This neighborhood has recently become one of the trendiest districts of the city offering a great variety of bars, gourmet and ethnic restaurants, design boutiques, art galleries and an active night life around Plaza Serrano and Plaza Armenia. The denomination “Hollywood” refers to the presence of the main TV, radio and film making producers’ studios in the area. This duplex apartment is located on the fourth floor facing the street. The building features a small swimming pool, solarium, washer and a barbeque grill. - LIVING AND DINING ROOM: Comfortable living room with a two-seat sofa and coffee table. There is a glass dining table with four chairs. 32” LCD TV, DVD and music stereo with input for iPod. Air conditioning hot/cold. Wooden floors. Access to the balcony. 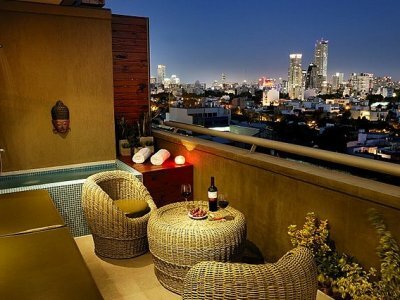 - BALCONY: Lovely balcony offering stunning views of the city. It can be accessed from the living room. It includes a table and chairs. Outside access to the terrace. 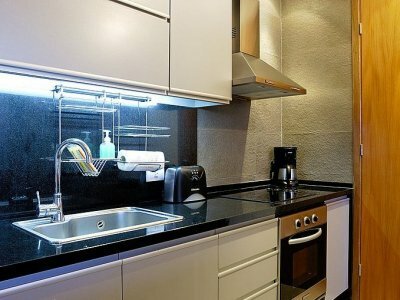 - KITCHEN: Modern and fully-equipped with fridge with freezer, microwave, coffee maker, toaster, juicer, tableware. - TOILETTE: full equipped guest toilette. - MASTER BEDROOM: This bright room has a queen-size bed and it includes all necessary bedroom furnishings. 32” LCD TV. 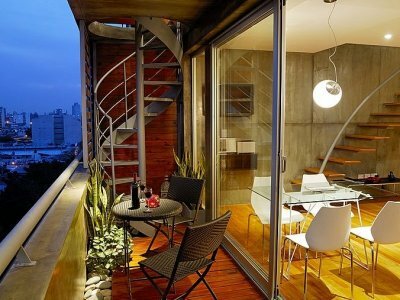 Beautiful open view to the terrace and the city. Air conditioning hot/cold. 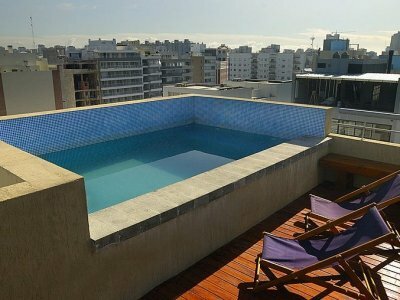 - TERRACE: The beautiful terrace displays differents types of seats, table, and a mini dipping pool for two people with an overhead shower. 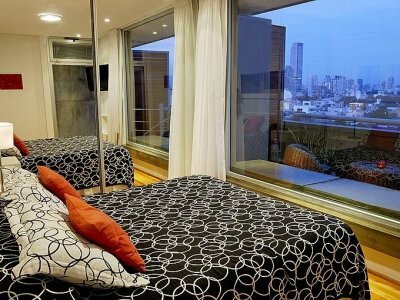 From the master bedroom you have an open view to the terrace and the city. - SECOND BEDROOM: With a queen-size bed that can be split into two twin beds and all bedroom furnishings. Air conditioning hot/cold. 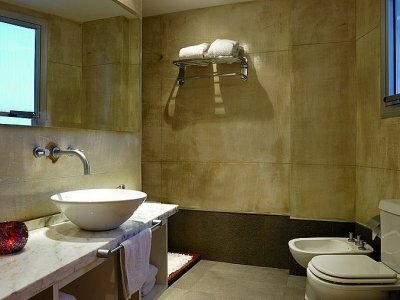 - BATHROOM: Complete with bathtub and shower. Hair dryer. No children under 10 years old are allowed in this apartment. 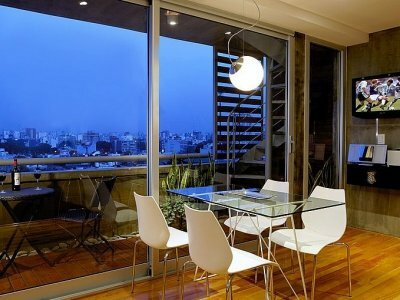 If you are visiting Buenos Aires with family or friends we have more apartments located on the same building. These rates are final in USD; they include: building expenses, local phone calls (control line for limited local calls), cable TV, electricity, water, gas, high-speed internet and taxes.